There is a habit that my team has done on a weekly basis for over three years now. We did this even before Lead Cookie existed when it was just myself and my ops director. This habit has been a complete game changer for our business. In this article, I will explain what Workshop is, how we run it, and how you can create your own, no matter how big or small your business is. I originally picked up this concept from Chet Holme's book called The Ultimate Sales Machine. Yet, for Lead Cookie, it has solved far more operational problems than it has sales problems. I've seen many other books share similar ideas of this concept though. Every week, our team meets for 60 minutes. We have a list of problems in our business. We work together to come up with solutions to those problems. It's so simple. Yet it is INSANELY powerful. We meet every week and rarely ever cancel. When things are busy, we still hold workshops because we know we need them even more. This gives us time to step back from day-to-day work every week and look at how we can improve our systems. And the key part is that we do this as a team. I don't show up and command these workshops. I don't supply all the topics. It all comes from everyone on the team. And we all brainstorm solutions. It's super simple. We started with a giant board of ideas on Trello. Now, we are moving that over to Asana. This isn't crazily organized. It is more or less a brain dump of ideas for things we could improve. Anyone is allowed to put a new "idea" in the column at any time. On each workshop call, my ops director or I will typically walk through the topics and facilitate a conversation. Everyone doesn't always agree, but we listen to each person's opinion and then come to a decision. 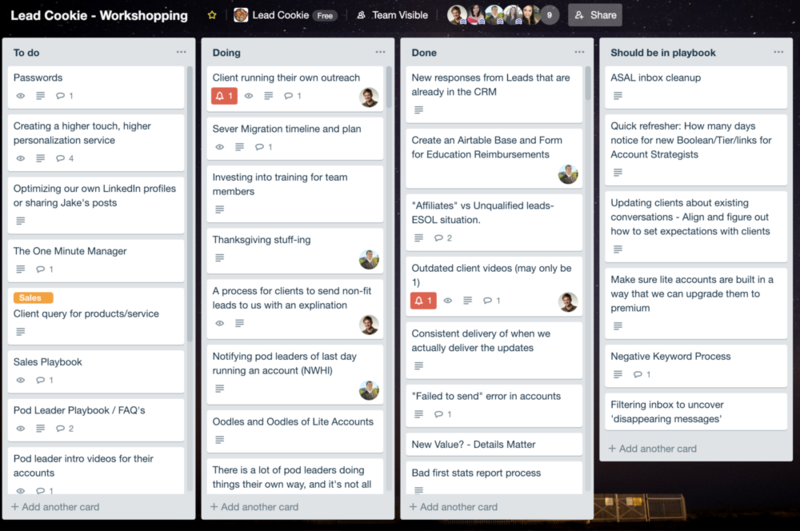 Below is a screenshot of our Lead Cookie Trello board. It's not pretty. It's not even very organized. BUT it works. And, it is a place to store our ideas and items to discuss. Now recently, we launched a new service offering from Lead Cookie called Lead Cookie Nurture. Even though it's from the same brand, this is essentially a brand new offering with a completely different set of problems for the team to discuss. For Lead Cookie Nurture, we hold a separate workshop to help build and improve these operations. So this time around, I decided to build our workshop board in Asana, which makes it much easier to assign tasks as outputs of our workshops. This isn't as dated, so it's more organized. Also, we have a workflow for this particular board: For any task that needs to be done later, we can create it on our general project management board during the workshop meeting. To run an effective workshop call, you first need things to "workshop." There are two ways we typically capture these. Team members brainstorm or jot down ideas throughout their work week. If we have nothing on the board, we will brainstorm problems together at the start of the call. One person should be designated as the facilitator. For a long time I did this, and now I have handed it over to my ops director. You pull up cards or items on the board that people want to workshop. You get clarity on the problem from whoever put the idea out there. You hear what challenges or problems others have faced with this. You ask for feedback or solutions to the problem. You take notes and then convert those into action steps as an output of the discussion. Many times, the output is simply that people now know how to do something they didn't before. Or we may create a new process or script. Or the output may be for someone to try and fix or improve something. The outputs can vary, but the key is that we all work together and come up with solutions. We have been doing workshops for three years, even since before Lead Cookie existed. Even then, we found things to fix or improve. Build the habit, and you will learn to love it and live by it. And you will fix so many problems before they turn into burning fires. One hour, per week, will compound over time and drastically evolve your business.